There could not be a Roman city without hippodrome and that which became the capital of the empire in place of Rome had one that truly honored its greatness. 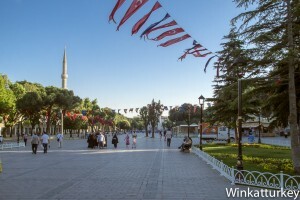 Currently the Sultanahmet Square, although the presence of Blue Mosque seems to overshadow everything else, Visitors can admire the remains of what was once the center of social life of the city and still home to some samples of its glorious past. Including, the oldest monument in Istanbul, Egyptian obelisk brought from Luxor having 3500 years ago. The Hippodrome was a fabulous facility that could accommodate a hundred thousand people and the imperial box communicated directly with the Grand Palace. He had 450 meters long and chariot races were so popular that the city was divided into two camps, green and blue, whose rivalry extended to the political arena and even religious. Decorating the Hippodrome was a towering bronze chariot was stolen by Venetian Crusaders in the sack of Constantinople 1254, years after the horses were put in the Cathedral of San Marcos. Three other monuments that have actually reached our days, although in different condition, it is the Egyptian obelisk, snakes column and obelisk of Constantine. The Egyptian obelisk was built in distant Luxor by Pharaoh Thutmose III and his Egyptian hieroglyphs tell a victory by the river Euphrates in 1450 AC. The monument was moved from the Temple of Karnak to Alexandria and centuries later the Emperor Theodosius the Great brought him the Hippodrome of Constantinople. He had a twin who was also removed from its original location and is now known as the Lateran Obelisk and is the highest in Rome. 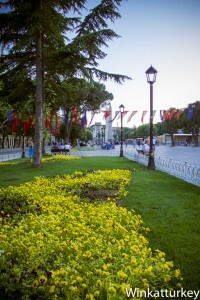 Only a third of the obelisk is preserved and is placed on a pedestal with Byzantine reliefs. The top is made of red granite from Aswan, and is in much better shape than the marble pedestal despite having almost 2000 more years. The column of snakes is also a much older element Hippodrome own. It was part of a monument that the Greeks offered to the god Apollo after his victory in the battle against the Persians at Plataea. Representing three intertwined snakes, column symbolized the union of the Greek cities to face the invader. Initially it was placed in Delphi and remained there for 800 years until the Emperor Constantine the Great sent relocate Year 324. Currently only the base of the spine is preserved and we can see part of one of the original three-headed serpent in the Istanbul Archaeological Museum. At the other end of the Hippodrome found the last monument of the Byzantine era that remains, is the Obelisk of Constantine. The date of its construction is unknown but in the tenth century the Emperor Constantine VII sent him restore and covered with bronze plaques. In the sack of the city during the Fourth Crusade stole the plates and the interior was exposed again. During the Ottoman era, Janissaries youth climbed the obelisk to showcase their preparation and it deteriorated even more monument. The fourth monument can admire at the Hippodrome is the German source, given to the city by Kaiser Wilhelm II in gratitude for their hospitality during his visit to Istanbul 1985. The fountain was built in Germany and then was moved piece by piece to its current location. It is a viewpoint with eight marble columns and a dome with golden mosaics inside. 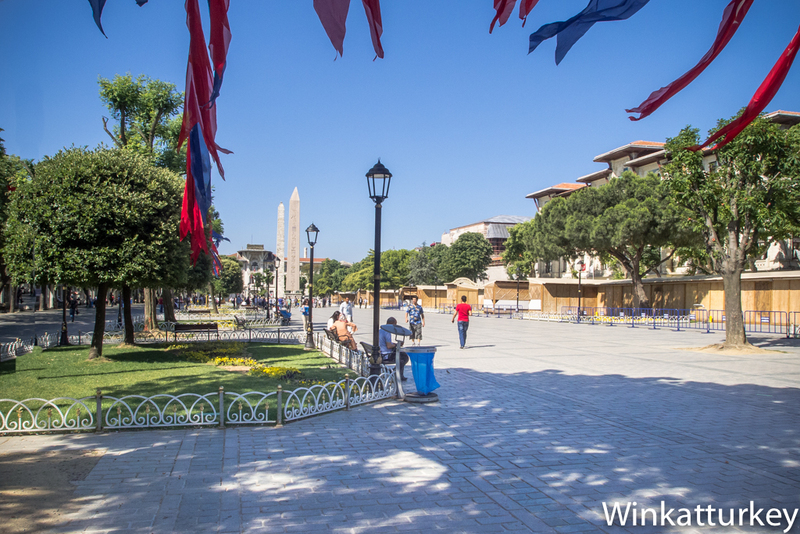 The Hippodrome is now a large square closed to traffic known to all tourists in the city. If we visit Istanbul during Ramadan, find the food stalls filled place that gets crowded at sunset to celebrate Iftar, the dinner to break the daily fast. During the rest of the year there are terraces where you can sit and have a drink and take a break in the busyness of our visit.